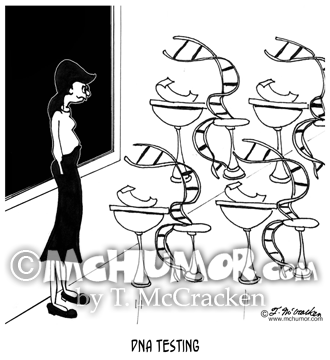 Biology Cartoon 6575: "DNA Testing." 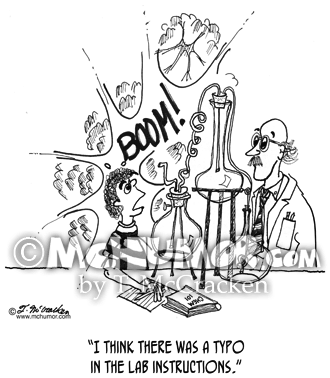 In a classroom double helixes take exams. 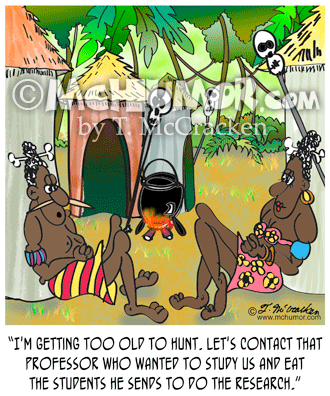 Anthropology Cartoon 7713: A cannibal saying to another, "I'm getting too old to hunt. 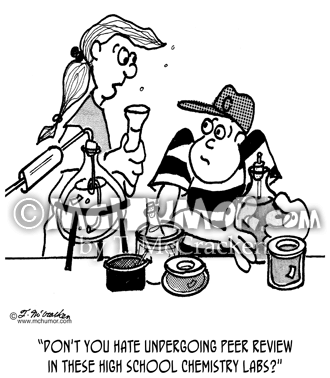 Let's contact that professor who wanted to study us and eat the students he sends to do the research." 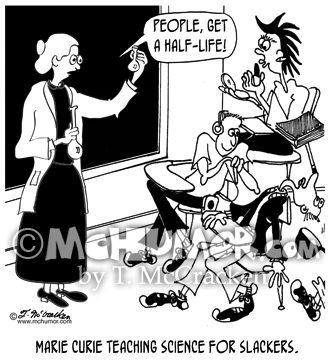 Radiation Cartoon 8879: "Marie Curie teaching science for slackers." She says, "People, get a half-life!" 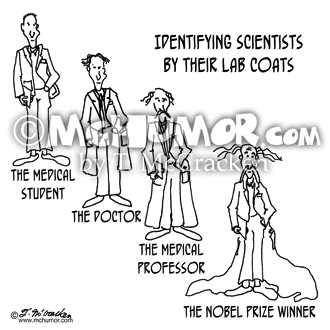 Scientist Cartoon 0779: "Identifying Scientists by their Lab Coats. "The Medical Student,” ”The Doctor,” “The Medical Professor” and “The Nobel Prize Winner.” Each has a longer coat; the prize winner's is a veritable train. 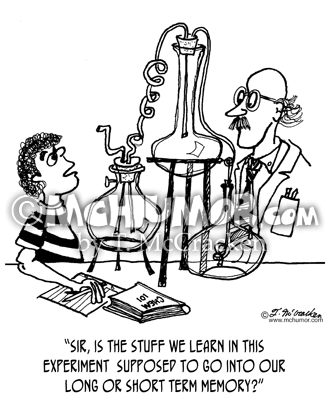 Memory Cartoon 1935: A kid in a lab class asks, "Sir, is the stuff we learn in this experiment supposed to go into our long or short term memory?" 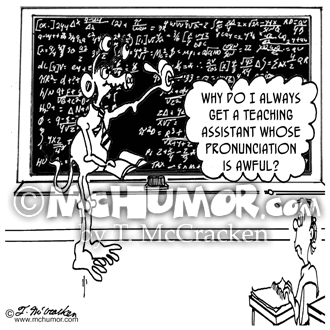 University Cartoon 5073: A student with a space alien as a teacher thinking, "Why do I always get a teaching assistant whose pronunciation is awful?" 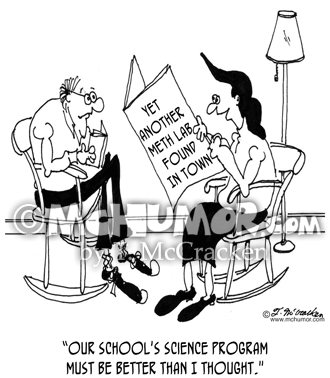 Meth Cartoon 7049: Reading a newspaper article, "Yet Another Meth Lab Found In Town," a woman says, “Our school's science program must be better than I thought." 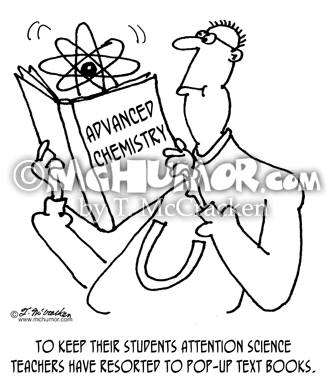 Science Cartoon 5925: "To keep their students attention science teachers have resorted to pop-up text books." A big atom pops out of an "Advanced Chemistry" book.